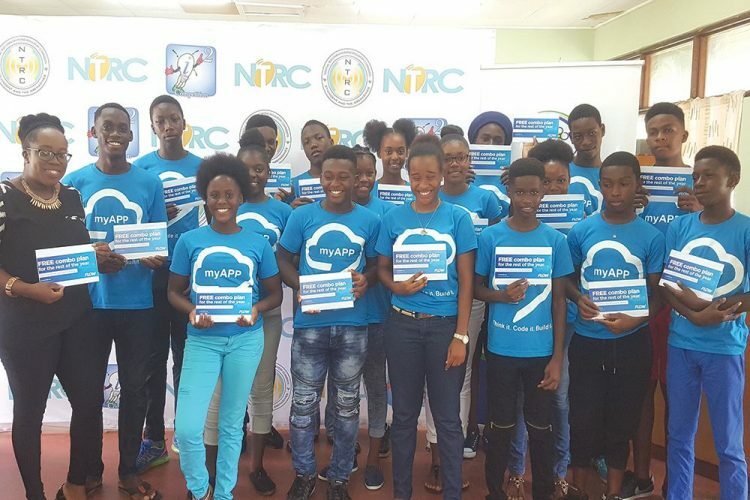 Rayshorn Dickson, a Petit Bordel resident, emerged as valedictorian in the North Leeward leg of the National Telecommunications Regulatory Commission (NTRC) âmyAPPâ Summer Programme. Dickson was recognized last Friday, August 25, during the closing ceremony of the summer programme, which was held at the Petit Bordel Secondary School (PBSS). The âmyAPPâ Summer Programme, which also had a leg on Union Island, taught participants between the ages of 13 and 18 years old how to code and design mobile applications. Dickson, with the help of Jerolyn Edwards of Rose Bank, designed and built a menu app that can be used to list, describe and give the price of foods available at a restaurant. The 15-year-old student of the St Vincent Grammar School (SVGS) said that he and Edwards came up with the idea and used what was taught to them by tutor Jason Alexis to build the app. He said while the app is not âperfect as yet,â he is proud of himself, as this is his first time taking on a task of this nature. âThe NTRCâs course is nice. Before I came, I did not expect something this good and I will be trying do other apps,â said Dickson, who will begin fourth form when schools reopen on Monday. She said that âmyAPPâ was fun and she enjoyed it. The programme graduated 19 students from the North Leeward area, who were exposed to four weeks of training in coding and designing mobile applications. Lecturer Jason Alexis said students learned the foundation of how to build a mobile application using Android studio. He said the students grasped the idea with one person creating a calculator and another a fidget spinner. âFor beginners in a four-week programme, they did a good job,â said Alexis, who thinks the programme has continuity, because a foundation has been created. He is glad the NTRC allowed him to guide these students. Also present at the graduation ceremony was consumer and public relations manager at the NTRC Keisha Gurley, senior marketing officer at the Bank of St Vincent and the Grenadines (BOSVG) Omari France, marketing and communications officer at FLOW Nikala Williams and Digicel sales representative Dowaine Rodgers. Gurley said that in 2015, the NTRC introduced myAPP with the objective to teach participants how to code and design mobile apps and they are proud of the outcome so far. Williams commented that FLOW decided to invest in the programme because that meant investing in the youth and therefore investing in the future. She said that there is a demand for coders and programmers, so this programme is ensuring the youths have a future and their future is protected. France commented that the BOSVG recognizes the importance of supporting public engagements like this programme. He noted that the Bank has a keen interest in youth development. The participants were all given gifts from sponsors FLOW, Digicel and BOSVG.